Figure 1. Color fundus photography, both eyes. OD (Left image): There was severe, diffuse optic atrophy of the optic nerve. OS (Right image): There was bow-tie (band) optic atrophy of the optic nerve. Figure 2. Goldmann kinetic perimetry, OS. There was superior greater than inferior visual field loss respecting the vertical meridian OS. The patient was no light perception OD. 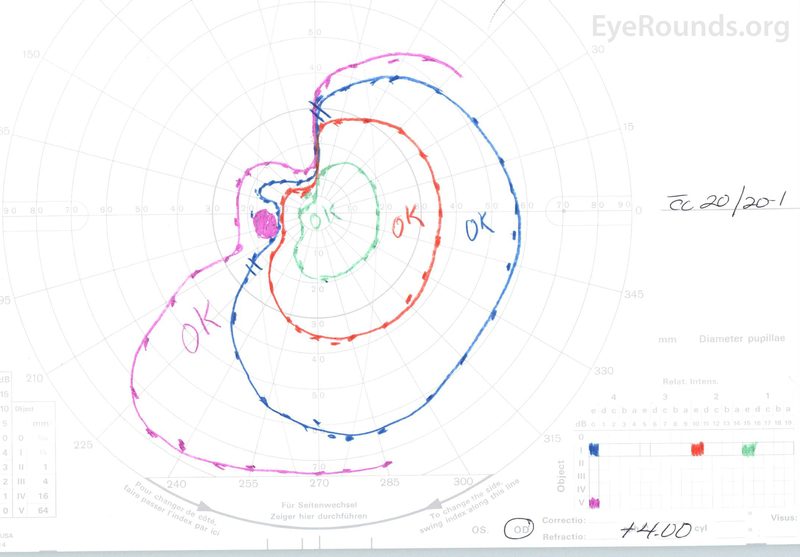 Overall, his visual field loss was consistent with a junctional pattern secondary to a lesion involving the junction of the optic chiasm and right optic nerve. Figure 3. 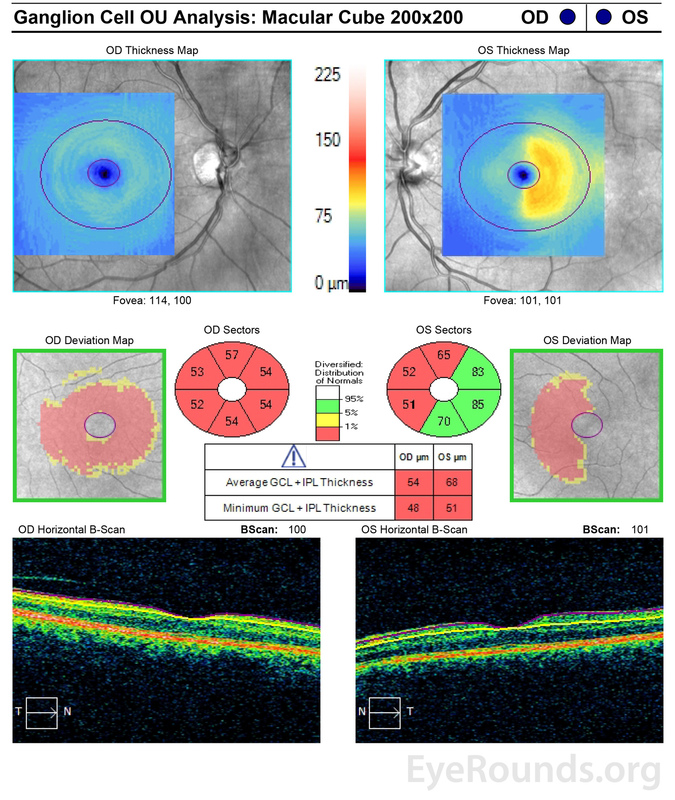 Ocular coherence tomography of the macula. There was diffuse ganglion cell layer (GCL) thinning of the right eye and nasal GCL thinning of the left eye, corresponding with the patient's diffuse vision loss OD and temporal visual field loss OS. The patient was a 57-year-old man with vision loss in the right eye (OD) greater than left eye (OS) in the setting of a craniopharyngioma, which was resected 16 years prior. His visual acuity had been no light perception OD and 20/20 OS since the procedure. Pupils were equal and reactive with a >3 log unit RAPD OD. Dilated funduscopic examination showed severe, diffuse optic atrophy OD and bow-tie (band) optic atrophy OS (Figure 1). Goldmann visual fields showed a superior greater than inferior temporal defect OS (Figure 2). Ocular coherence tomography of the macula showed diffuse ganglion cell layer (GCL) thinning OD and nasal GCL thinning OS (Figure 3). Contrast-enhanced magnetic resonance imaging (MRI) of the brain and orbits showed a stable tiny ring-enhancing cystic lesion anterior to the pituitary infundibulum and atrophy of the right greater than left optic nerves. The presence of bow-tie, or band, atrophy suggests that there is a compressive optic neuropathy from an anterior chiasmal and/or medial, posterior optic nerve lesion. This clinical sign warrants further evaluation with magnetic resonance imaging (MRI) or computed tomography (CT) in a patient with unexplained vision loss. Unilateral band atrophy can also be seen in a patient with a unilateral optic tract lesion.